Evered (often written as Everard) Bruce Way was born in Tincleton, Dorset, in 1889 and baptised there on 6 October 1889. He was the youngest of the five children of master blacksmith Uriah Way (1845-1932) and Jane née Robins (1858-1929). Uriah and Jane's children were Louis Samuel (1881-1935), Harold Egbert (1884-1981), Ethelbert Thomas (1886-1968), Mable Ella, known as Ella (1888-1960) and Evered. The family were living at Tincleton and listed in the 1901 census as well as the 1911 census - although by the time of the latter, Evered had move to Yeovil and was boarding at 9 Mill Road (Mill Lane ?) with the family of William Palmer. 21-year old Evered gave his occupation as a music salesman. From 1903 until he enlisted, he worked for Godfrey & Co in the Triangle. In the autumn of 1912, Evered married Maude Hodges (1890-1935) at Yeovil. They set up home at 118 Goldcroft and were to have two sons; Arthur Bruce (1913-1996) and Harold J (1916-1970). Evered enlisted at Yeovil on 20 July 1916, joining the 1st Battalion, Dorsetshire Regiment. His Service Number was 19044. The 1st Battalion, Dorsetshire Regiment had been fighting on the Somme. On 1st July 1916 (the start of the Somme offensive) they attacked near Authuille Wood (now Haie Wood) with 69 men having died on that day and total casualties of some 501 men killed, wounded or missing over the first three days of the battle. After several days of heavy losses, the Battalion were withdrawn north until October. In November they fought again near Beaumont Hamel in the closing stages of the offensive. In November 1916, Evered was posted to France to join his battalion and would probably been involved in the action at Beaumont Hamel on arrival. In 1917, after a long period near Nieuport, the Dorsets were thrown into the final attack at Passchendaele near Ypres. After a brief rest, they returned to the Ypres sector in Houthulst Forest but, on 27 March 1918 they were rushed to Arras to help halt an overwhelming German attack which proved be the final major German offensive of the war. During the night of 20-21 May 1918 the Dorsets were involved in a raid at Hamelincourt, described as being one of the finest raids of the war, which cost them 77 men and 7 officers killed or wounded. After the German offensive was halted, the final Allied advances began. In the Battle of Amiens in early August 1918, the Battalion attacked at Damery. Evered was with his regiment when they took part in the Battle of Amiens, 8 to 11 August 1918. The Battle of Amiens, also known as the Third Battle of Picardy, was the opening phase of the Allied offensive later known as the Hundred Days Offensive that ultimately led to the end of the First World War. Allied forces advanced over 7 miles (11 kilometres) on the first day, one of the greatest advances of the war. The battle is also notable for its effects on both sides' morale and the large number of surrendering German forces. This led Erich Ludendorff to describe the first day of the battle as "the black day of the German Army". Amiens was one of the first major battles involving armoured warfare and marked the end of trench warfare on the Western Front. The 1st Battalion lost 321 killed, wounded or missing. 30-year old Evered was killed by a machine gun bullet on the last day of the battle, 11 August 1918. The Western Gazette, in its edition of 6 September 1918, reported "Lance Corporal EB Way, of the Dorset Regt., whose wife lives at 118 Gold Croft, has been killed in action in France. He was 30 years of age and joined up on July 20th 1916, and was drafted to France in November of the same year. For 13 years he was engaged in the piano and music warehouse of Messrs. Godfrey & Co., The Triangle, and was very well known. Mrs Way received a notification from the Record Office that her husband was wounded but later received a letter from a chaplain to a Canadian unit, to the effect that Lance Corporal Way had been killed in the recent advance and that his body had been buried in a wheat field behind the present front line. The chaplain added that he had apparently been killed by a machine gun bullet whilst gallantly advancing on the battlefield, and that death had evidently been instantaneous." 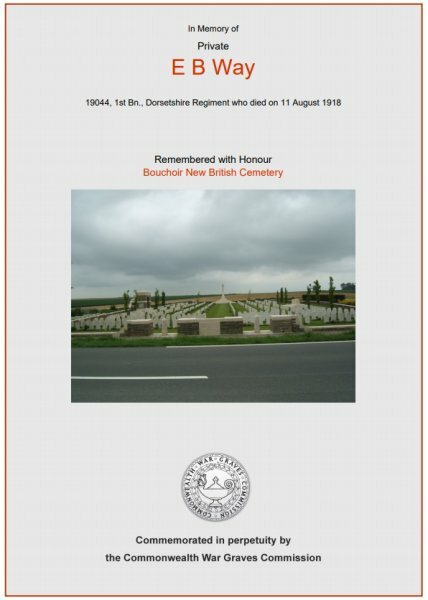 Evered Way was buried at Bouchoir New British Cemetery, Somme, France, Grave III.E.110. and his name is inscribed on the War Memorial in the Borough. 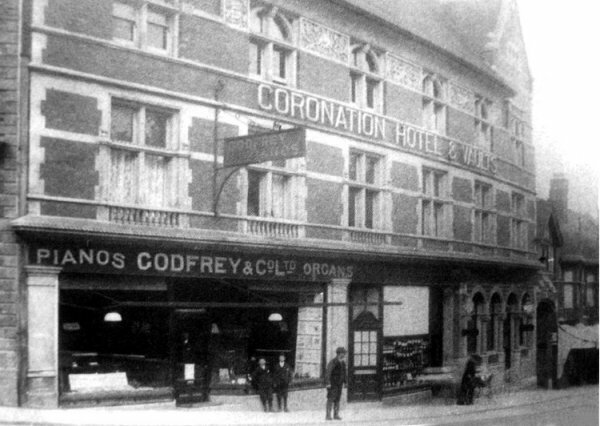 An early photograph, taken about 1905, just after the Coronation Hotel & Vaults opened with Godfrey & Co Ltd's piano and organ shop, where Evered was a music salesman, on the ground floor. 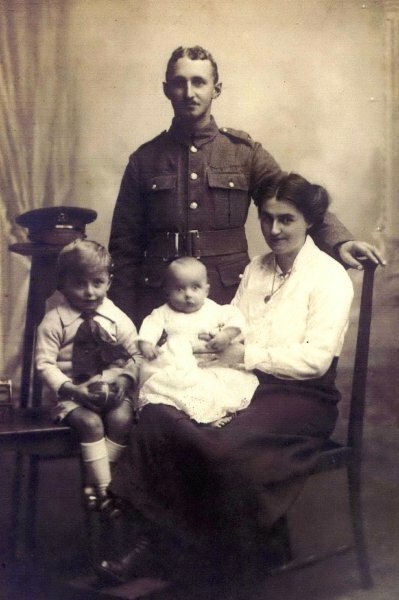 Evered with his wife Maude, 3-year old son Arthur Bruce and baby John Harold. Photographed in 1918, shortly before Evered's death. The Commonwealth War Graves Commission certificate in memory of Evered Way.